I saw in my email today that the University of Utah placed third in the World Cup Quidditch Championship. They beat out schools like UCLA and Arizona in the Western Regionals to get to the World Cup. I didn’t know that Quidditch actually existed, let alone as a completive sport on the University level. Quidditch, as anyone would know by now, is the sport played at Hogwarts in the Harry Potter book and movie series. 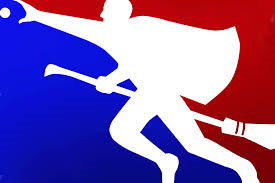 The players fly around on brooms trying to put a misshaped ball called a Quaffle through a series of elevated circles, while dodging other balls called Bludgers, and while two specialized players chase a Golden Snitch. To make it possible for muggles to play, some elements have been changed. My point is not to explain Quidditch, or to make light of the fact that near-gown-ups are playing a make believe game, ignoring the fact that the game is essentially impossible. My point is that sometime during their time before college, these students were touched enough by something they thought was wonderful and they still want to be part of it. Harry Potter resonated with millions of people. Tens of millions, maybe hundreds of millions. JK Rowling didn’t just write a book, she touched people. She made a difference in their lives. She brought them a joy and a feeling that they don’t want to let go. What can we do to touch people. Write a world class best selling book series that inspires kids of all ages to read? Sure. How about just be nice to people? Smile. Say thank you. Hold a door open. Support a fund raiser for that little kid at the door. Do something nice for someone else. You’ll never know how much something will mean to someone else. What impression you might make. But if you did something nice everyday for someone else, you might find that your legacy might be a nicer you. And that’s better than winning First at the World Cup of Quidditch.